LCS(L)(3) ships, nicknamed mighty midgets or miniature destroyers, served as fire support ships during the last year of WWII, including the Battle of Okinawa. The first ten LCS(L)(3) (Landing Craft Support Large Mark 3) ships were commissioned from June to September 1944. LCS(L)(3) ships served alongside destroyers at radar picket stations around Okinawa, where they encountered many kamikaze planes and picked up survivors from other ships sunk or heavily damaged by kamikaze hits. This authoritative history of the 130 LCS(L)(3)s provides excellent battle summaries, background information, and historical photos. Chapter 1 describes LCS(L)(3) development, capabilities, training, and crew responsibilities. LCS(L)(3) ships provided fire support for troop landings and identified locations of small shore gun emplacements by firing tracer rounds so larger ships offshore could destroy them. A LCS(L)(3) ship had a crew of six commissioned officers and 65 enlisted men. 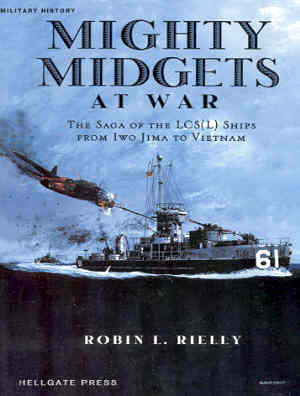 Mighty Midgets at War effectively describes LCS(L)(3) battle action, but the narrative at times becomes difficult to follow with 130 ships designated only by numbers. Rielly somewhat lessens this drawback by following LCS(L)(3) 61 and her crew throughout the book while also relating significant battle action by other LCS(L)(3)s. This type of book by necessity concentrates on ships’ histories rather than the stories of individual crewmen, but the author includes a few short personal accounts. This balanced and accurate history book by Rielly, who serves as Historian and Archivist of the National Association of USS LCS(L) 1-130, reflects extensive research of not only books and articles but also official Navy reports, ship logs, and action reports. A 20-page bibliography lists these wide-ranging sources. The book’s appendices include information on construction, launching, and disposition for each LCS(L)(3). Chapter 2 covers LCS(L)(3) operations at the Philippines, Iwo Jima, and Borneo, starting when five ships led landing craft for an assault on the west coast of Luzon on January 29, 1945. Chapter 3 has an objective summary of Japan’s kamikaze squadrons and includes information on other suicide weapons such as shinyo explosive motorboats and kaiten human torpedoes. Chapters 4 to 6 describe the many kamikaze attacks faced by LCS(L)(3) ships during the Battle of Okinawa. The last chapter deals with postwar activities of 72 LCS(L)(3)s not deemed to be surplus. The U.S. Navy transferred these ships to foreign countries such as Japan, France, and Vietnam. Kamikaze planes sank two LCS(L)(3)s while they were on radar picket duty to provide anti-aircraft support for destroyers trying to stop enemy planes from reaching the main fleet. On April 12, 1945, while at Radar Picket Station 1 north of Okinawa, LCS(L)(3) 33 shot down one kamikaze plane, dodged a second one that took off the ship’s radio antenna, but sank after being struck by a third one. On April 22 at Radar Picket Station 14 northwest of Okinawa, LCS(L)(3) 15 sank within three minutes after one kamikaze plane in a group of 37 planes crashed into the ship with a bomb carried by the plane exploding soon after. The attack killed 15 men and wounded 11 men. In addition to the two LCS(L)(3)s sunk, 11 others were damaged in kamikaze attacks during the Battle of Okinawa (Warner 1982, 329-33). 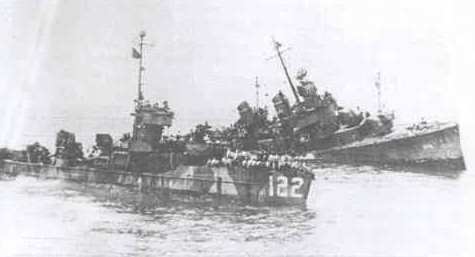 Japanese shinyo explosive motorboats sank more LCS(L)(3)s than the two sank by kamikaze planes. About 30 shinyo motorboats attacked LCS(L)(3)s in Mariveles Harbor in the Philippines on February 16, 1945, but the book provides no details on this attack. The explosive motorboats sank LCS(L)(3)s 7, 26, and 49 and severely damaged LCS(L)(3) 27. Although destroyers provided the primary firepower at radar picket stations around Okinawa, LCS(L)(3) guns also shot down many incoming kamikaze planes. For example, at Radar Picket Station 1 on April 16, 1945, LCS(L)(3) 51 shot down six attacking planes and helped fight fires on the destroyer Laffey (DD 724) after that ship had been hit by several kamikaze planes. LCS(L)(3) 51 received a Presidential Unit Citation for her actions. During the Battle of Okinawa, several LCS(L)(3)s rescued survivors after kamikaze attacks that sank or heavily damaged other ships. For example, on June 10, 1945, after the destroyer William D. Porter (DD 579) was hit by a kamikaze plane and started to sink, LCS(L)(3)s tried to tow the ship to port but failed. The destroyer, which sank about three hours after the kamikaze plane crash, lost no men due to the superb rescue work of the LCS(L)(3)s. The photo at the bottom of this page shows LCS(L)(3) 122 crowded at her bow with survivors from William D. Porter shortly before she sank. Even though William D. Porter lost no men, LCS(L)(3) 122 was hit the following day by a kamikaze plane and lost 11 men with the number of wounded totaling 29. Mighty Midgets at War provides an excellent historical overview of the 130 LCS(L)(3) fire support ships that in 1945 experienced much battle action, including numerous kamikaze attacks.